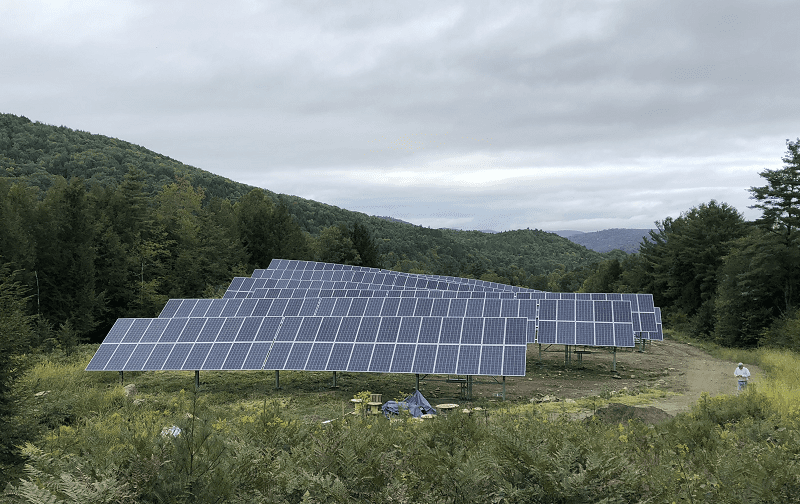 POST MILLS — As Vermont’s ever-shifting energy landscape continues to shake up the renewable energy sector, a community solar array coming online this month will showcase a new twist on existing financial models. “This is a hybrid,” said Dori Wolfe, whose company, Wolfe Energy in Strafford, has purchased two shares — at a cost of $2,784 each — of the 185-kilowatt array, which is sited beside a closed landfill site just off Route 113 in Post Mills. Community solar arrays — those which serve multiple customers, some of whom might not have solar-friendly homes — are nothing new in Vermont. Randolph and Strafford each host arrays that serve various residential customers, while other community arrays are built by nonprofit, commercial, or governmental entities, such as the 150-kilowatt one that supplies Thetford Elementary School’s energy. The nearly finished “Thetford-Strafford Community Solar” array is designed to generate 230,000 kilowatt-hours of electricity during its first year, enough to power about 35 average Vermont homes. But it differs from projects in neighboring towns because it will be the first solar farm to serve a mix of customer sectors — the array is a partnership between residential customers, a commercial farm, and the town of Thetford itself. It’s that “combination of commercial and residential community members participating in the array” that makes it unique, according to Jim Merriam, president of Norwich Solar Technologies, which built the array. The shareholders (who live in Thetford, Strafford and Norwich) expect to recoup their investment and then some through reduced electric bills — about 85 percent of the electricity produced at the site will be sold to Green Mountain Power through the state’s net-metering program, which guarantees customers a minimum rate for feeding solar energy back into the grid. The remaining 15 percent of the power will be sold to the town of Thetford at 90 percent of the normal utility rate, which Wolfe said will exert downward pressure on the property tax rate. The town’s involvement will provide an important advantage over community projects such as the one in Randolph, where solar customer benefits are undercut by an annual shareholder fee, which goes to pay for property taxes on the site, according to Wolfe. Wolfe said she hopes that the Post Mills project will lead to a second phase in which more solar is installed on top of the adjacent landfill. Though having more solar options is expected to help more Vermonters access renewable energy, a report released earlier this summer by the Energy Action Network suggests that more regulatory action will be needed to get the state on pace for its ambitious goal of achieving 90 percent renewable energy by 2050. The state has made progress — in 2017, Vermont energy use was 20 percent renewable, up from 12 percent in 2010. But it is significantly off pace from achieving its targets, and there are signs that the situation will worsen. In 2017, the rate of newly added capacity was down 30 percent as compared to 2016, and new wind generation has seen an even steeper decline, according to the report. There are several reasons for the slowdown — one is that 2016 was a boom year, because solar developers were rushing projects through before new net metering rules took effect at the beginning of 2017. Meanwhile, a new, 30 percent federal tariff on solar panels produced overseas also has affected pricing, leaving solar projects looking for new ways to make the numbers work.